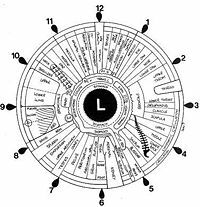 This is an example of an iridology chart, correlating areas of the left iris, as seen in the mirror, with portions of the left hand side of the body. Changes in color or appearance of the iris are said to indicate changes in the health of the corresponding section of the body. This is the corresponding chart for the right iris which relates to the right hand side of the body. The first use of the word Augendiagnostik ("eye diagnosis," loosely translated as iridology) began with Ignaz von Peczely, a 19th-century Hungarian physician. The most common story is that he got the idea for this diagnostic tool after seeing similar streaks in the eyes of a man he was treating for a broken leg and the eyes of an owl whose leg von Peczely had broken many years before. At the First International Iridological Congress, Ignaz von Peczely's nephew, August von Peczely, dismissed this myth as apocryphal, and maintained that such claims were irreproducible. The German contribution in the field of natural healing is due to a minister Pastor Felke, who developed a form of homeopathy for treating specific illnesses and described new iris signs in the early 1900s. However, Pastor Felke was subject to long and bitter litigation. The Felke Institute in Gerlingen, Germany was established as a leading center of iridological research and training. 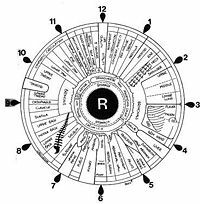 Iridology became better known in the United States in the 1950s, when Bernard Jensen, an American chiropractor, began giving classes in his own method. This is in direct relationship with P. Johannes Thiel, Eduard Lahn (who became an American under the name of Edward Lane) and J Haskell Kritzer. 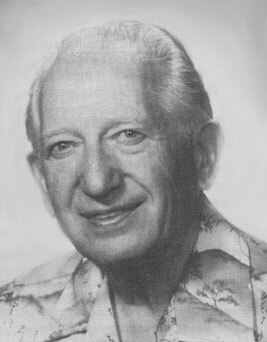 Jensen insisted on the importance of the body's exposure to toxins, and the use of natural foods as detoxifiers.